Life in Mascara: WHAT IS ON TOP OF THE MOUNTAIN FOR YOU? "I will lift up my eyes to the mountains; From where shall my help come? My help comes from the Lord, Who made heaven and earth." How often do we feel like we are climbing up that rocky mountain with no one to reach down and pull us up? We keep our head down and keep climbing. That is part of the problem. Your head is down. Look up. Look up to the tip of the mountain. 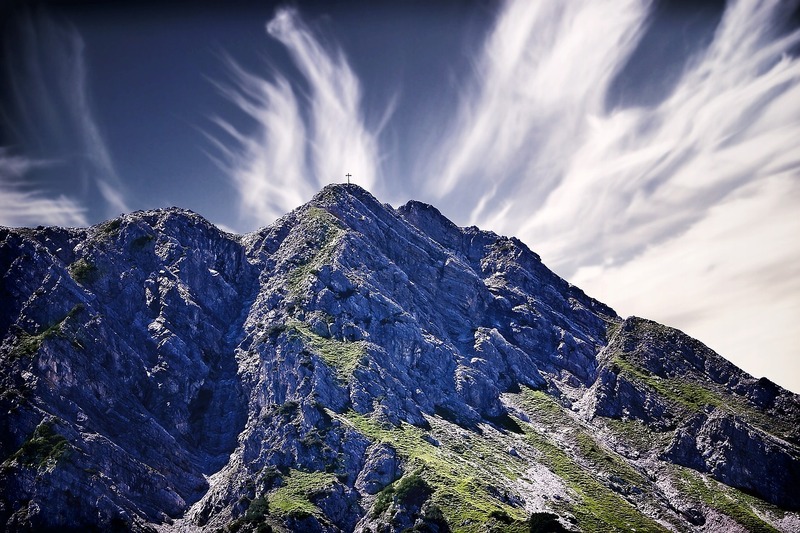 Much like that tiny cross on the picture above, waiting for you at the top of the mountain is the Lord. For many, Lent comes as a time defined simply by the sacrifice that you make for 40 days. For me, it is defined as the meaning behind that sacrifice. For 40 days (and often much longer after that) I offer up something to God. Something that can be difficult for me to give up or to do. And when I want to cave in and give up climbing that mountain, I lift my eyes to the mountain and look for Him. I am renewed in His faith in me and I am strong again. One sacrifice is not enough to keep my faith from wavering, from making me a model Christian. Far from it. Faith is something that you keep working on. It is rewarding in that your relationship with God will be that much stronger and you will feel fulfilled. What I can give Him for 40 days does not compare to what He gives me everyday. I will continue to walk up that mountain and to lift my eyes up to the Lord. What is on top of the mountain for you?